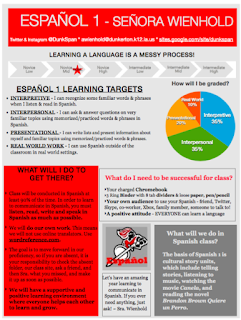 So this year I had every intention of making a fancy-smancy infograph syllabus like everyone else. I even started on on Pictochart. The little guy woke up interrupting my train of thought and then I decided for a variety of reasons that instead I wanted to make one that I could edit, adapt and reuse. The schedule at my new school is on trimesters. With each level only needing 2 trimesters of class, they circle around so a student could actually finish 4 levels of Spanish in 3 years. It is great that I do not have every level each trimester, but it means many classes switch each trimester. Long story short, I know that at the change of trimesters I will not have time to create a new fancy-smancy infograph syllabus, so I opted for a simple pages document instead. I actually used the same template as my Unit 1 plan for consistency, and stuck with the school colors as a color scheme. They are very basic since very few kids actually read them if it is stocked full of writing. I also just changed minor things to fit each level. UPDATE: If you would like to download editable versions of all 3 levels in both Pages & Word click here. Here are my trimester 1 syllabi for Spanish 1, Spanish 2 & Spanish 3. 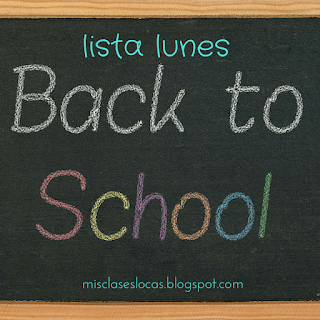 If you are looking for more back to school posts see my organized list of back to school posts, or click the label back to school. Update: If you would like to download all of my back to school products together, you can find them here. I finally just finished my first series on Netflix in Spanish, Gran Hotel. It was stretched over months, since I started during the school year. I only watched little chunks, sneaking in part of an episode, if baby boy decided to take an after school nap. It was worth the wait and a really great show. I picked it knowing I could continue to watch Iván from my beloved El Internado, Yon González, now as Julie Espinosa. 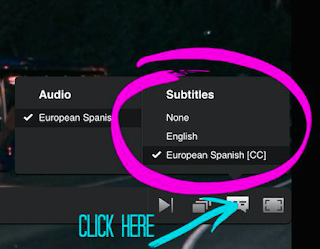 If you are looking to work on your own Spanish or possibly use the show in class, make sure to change the subtitles to Spanish using this post. Check out the trailer below for a taste of the show. IMDB - Grand Hotel. Even though the episode count is wrong on IMDB, there are actually 66 episodes in the 3 seasons, each about 60 minutes long. It would make for a great show for upper level Spanish students to watch since the suspense, mystery, and romance would keep most students interested. You would want to see if you think it would fit your students, since I would give the show a PG-13 rating due to some swearing, sexual content, and drinking. Below I have collected a few resources that could be used to supplement the show. There is an awesome guia interactiva from the Antena 3 website shows how all of the characters are related, but beware of spoilers telling who dies! 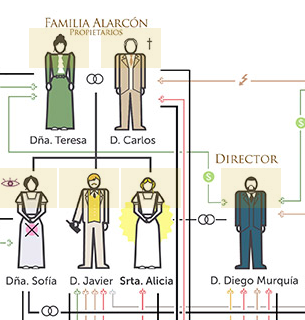 Below is just a small piece showing the Alarcón family, which would be great to teach family relationships. The show was filmed at the actual Palacio de la Magdelena in Santander, Spain. Students could investigate the past and present Palacio, or base a travel unit about going to Santander. Here is a website in Spanish about how to spend 2 days in Santander. This year I think I will stick with El Internado as a class show, but I will be keeping Gran Hotel on the back burner as a future possibility. 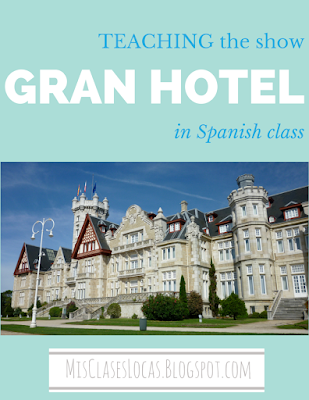 I will however, be recommending Gran Hotel to students as a choice homework option. Have you seen the show? Do you plan on using it in class? If you do, please share resources in the comments! "I have so much extra money to spend on my classroom and classroom library." I realized that I actually have quite a few posts with money saving ideas and ways to get free or cheap resources, so I know have them all grouped together under the label $ Saver. (All labels can be found on the left sidebar). 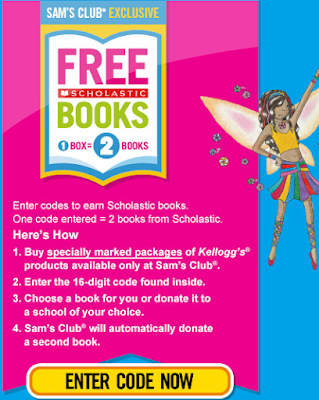 I blogged last year about how to get free books for your classroom from the Kelloggs Family Rewards program and now it is back! (No I am not a sponsor of these products). 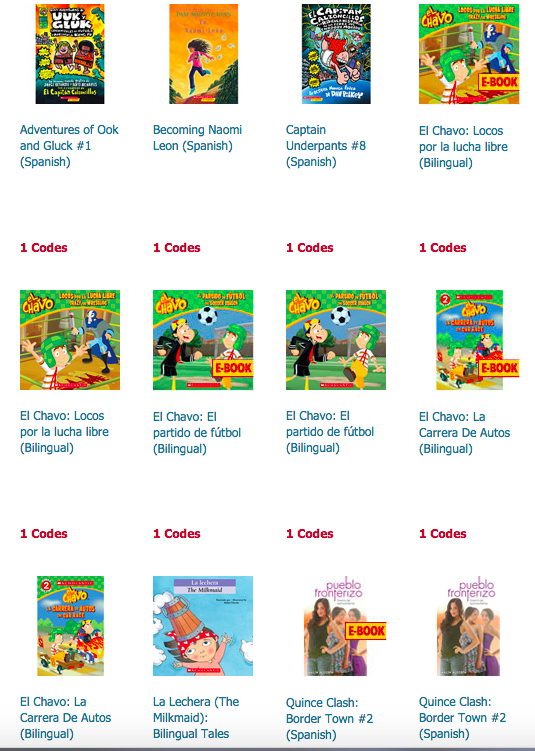 Last year, you could enter 3 codes from specially marked packages from anywhere to get a free book (In Spanish if you would like!). 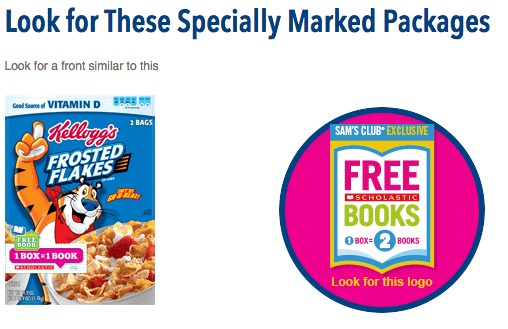 This year the packages must be from Sam's Club or Walmart, but 1 package gets you 1 (or 2!) free book(s)! The instructions can be seen below. By entering a code from a specially marked Kelloggs products from Walmart you get a free book, and from Sam's Club you get 2 books. 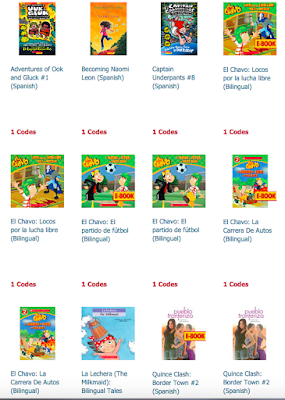 I do not usually shop at either of these places, but I might have to, since the books below in Spanish can be earned for free through the program. How can you get many free books? Last year I put a blurb in our quarter 1 parent newsletter, and actually had a parent bring in a stack of 18 boxes for me! Also, my mom and mother in law are good about saving codes for me as well. Just make sure that it has the "free book" code on the front, or you will just gets points and not a free book. 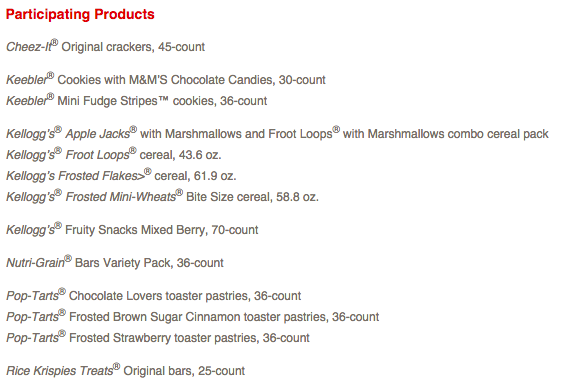 The list below are the participating products at Sam's Club. If you have another great money saving way to build your classroom library, please let me know! Lately everyone has been talking, tweeting, and pinning ideas for back to school. I am taking the great idea from Maris Hawkins, who put all of her back to school resources in one place. 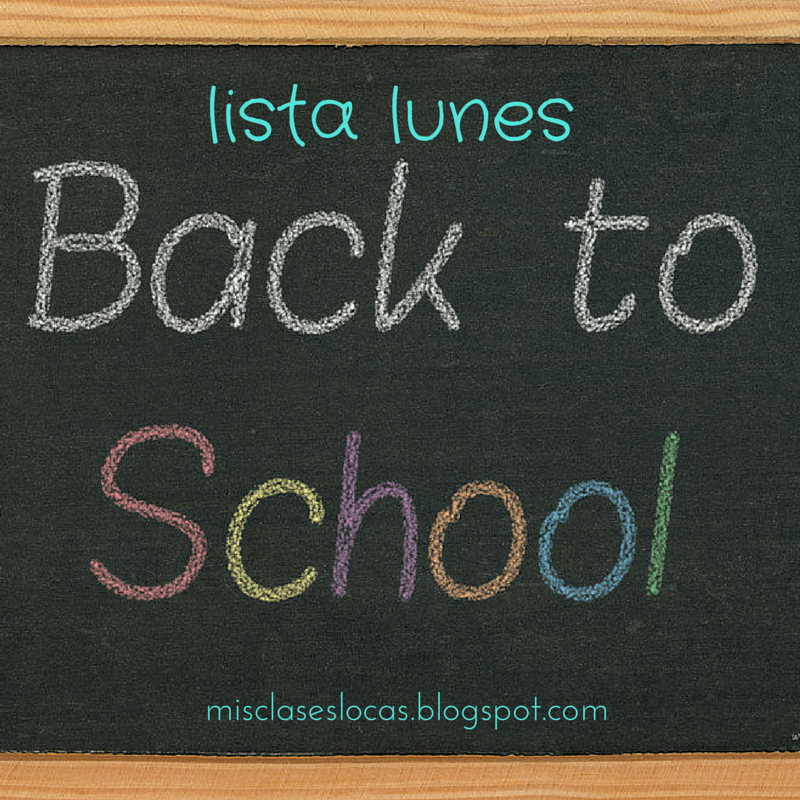 Here are a bunch of links including: 1st week of school plans, classroom set up, planning for the year, and getting to know your students. Enjoy! The most common questions I get asked about teaching with the show El Internado: Laguna Negra have been "how do you watch the show?" and "can you find it online or where do you buy it?" 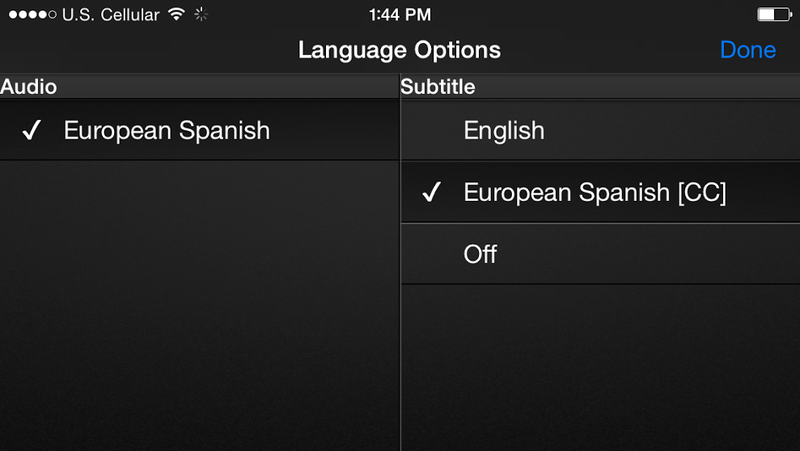 If you follow me, or many others on Twitter you already know the great news, El Internado is now on Nexflix! It does not matter if your class watches this show or not this is a Great thing all around. 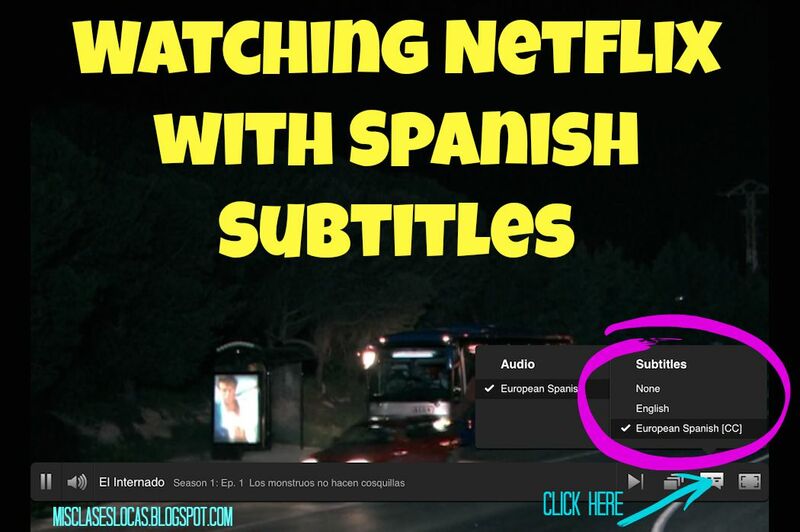 As a Spanish teacher you can personally watch it as PD for your own listening practice. It would also be a great homework choice option for those who have access to Netflix. *This only works if they are listed as an option. 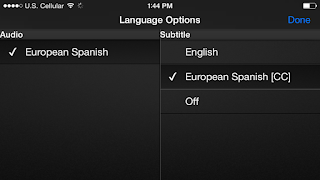 Below you can see El Internado has the option for None, English or Spanish, but unfortunately not all shows have the option of Spanish. That is it! What an easy way to increase your input, by having the ability to read what they are saying! Enjoy your Internado binge! A conversation on Twitter a week or so ago got me thinking about using the TV show El Internado: Laguna Negra to teach the culture of Spain. 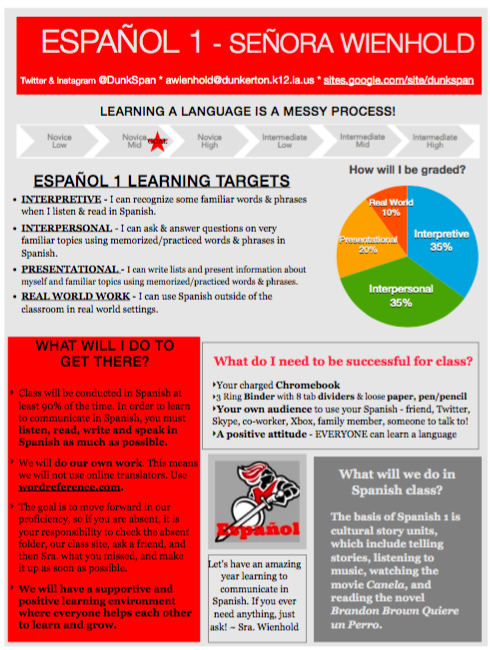 If you have been reading here for a while you know that this past year I followed the footsteps of many Spanish teachers, using the Spanish TV show El Internado on Fridays in Spanish II-IV. While the show was a hit in all classes, I failed in one aspect. 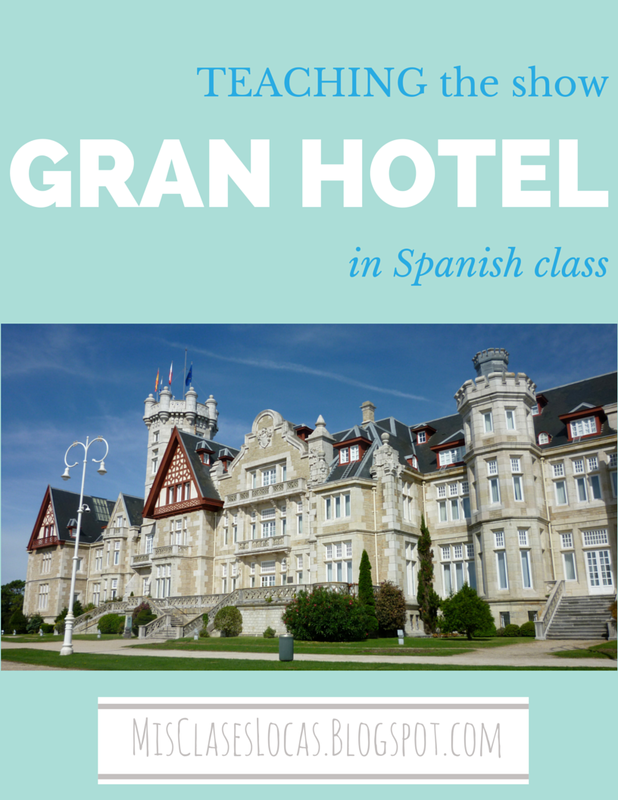 I wrongly assumed that by simply watching and talking about a TV show from Spain, the students would gain a deeper understanding about Spanish culture. Through the show many cultural elements can be brought to light and investigated deeper, but most students will not get them simply by watching the show. A great example of using a cultural point of the show El Internado as a launching pad for culture is this post about Ratoncito Pérez by Bethanie Drew. A big part of Season 1 Episode 5 is Paula loosing a tooth and this cultural unit about Ratoncito Pérez, the Spanish version of the tooth fairy, is a perfect way to introduce this episode. Just like the great TPRS Publishing teachers guides, a cultural aspect of the show is used to investigate the products, practices and perspectives of a target culture. As someone mentioned on Twitter, it is like the show El Internado was made for Spanish teachers with all of the possibilities for the classroom. I decided to start going through the first episodes and looking for cultural tidbits that could be expanded on in class for a richer understanding of the Spanish culture. I started this working document of ideas and would love if you would add to it! The first item that came to mind is something that comes up on almost every episode, breakfast. Food is something that makes an immediate connection with students, so it would be perfect to talk about. For example, from my personal experience studying abroad for a semester in Oviedo, Spain. My Spanish "madre" was an excellent cook, by breakfast was by far the most simple meal of the day, if you could even call it a meal. The common denominator in most households was coffee. Pretty much everyone starts their day with coffee, even kids have café con leche. Besides coffee, I was usually served a simple bread product: toast with jam, simple cookies, or magdelena. Other students who lived with families with children may have had cereal, yogurt, or juice as well. This follows exactly what is seen on the show. I created this activity to go along with talking about breakfast in Spain and El Internado. Let me know if you would like the editable Pages document. It has very basic vocabulary and can be used as a springboard for more personalized questions with the students. It can be used with episode 1 of season 1, or any time they eat breakfast on the show (which is almost every episode). Marcos, Paula & the Puleva boxed milk! 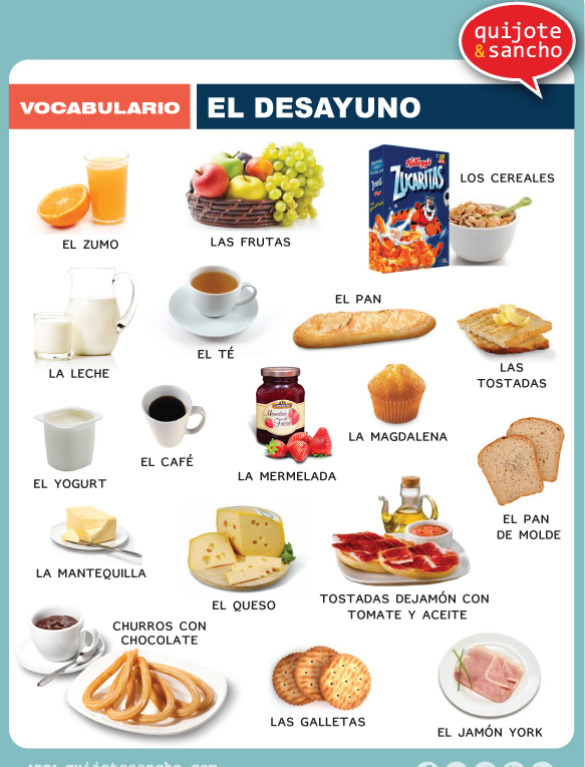 Photo - Vocabulario el desayuno - Idea: print or project this picture & have students circle what foods are shown on the show. I would love feedback or other ideas of cultural expansion from this show! 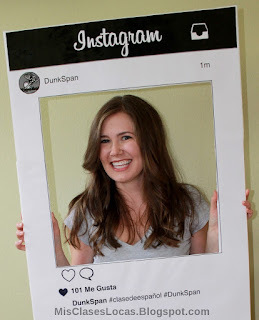 I mentioned in my 1st week plans that I wanted to create an Instagram photo booth. 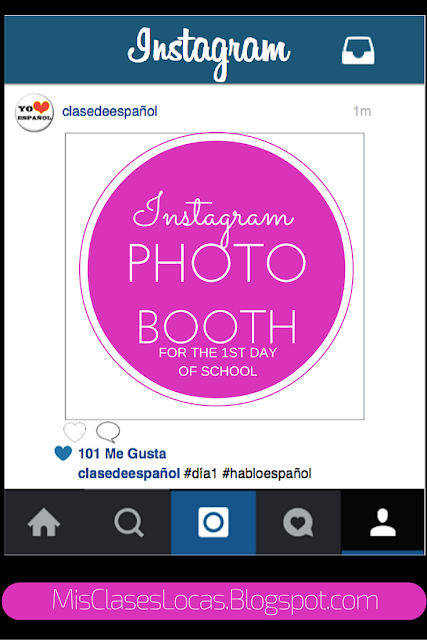 I though that this would be a fun thing to have set up in the classroom on the first day of school to help break the ice and document the day. I got the idea from this group at freshman orientation on the University of Northern Iowa campus, where I recruit for Camp Adventure. 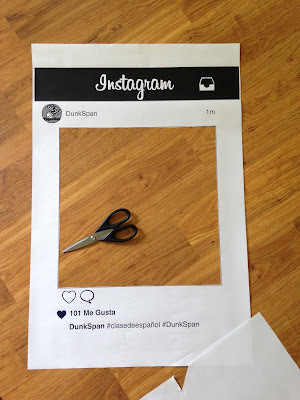 I asked the group where they got their Instagram prop and how much it costs and they told me a local advertising agency designed and made it for them for $90. Well I do not know about you guys, but that would pretty much be my budget for the entire year, let alone just for a fun class prop. So I decided I would try and come up with a cheaper alternative. (It cost me $6 total). Set up in classroom with directions & have fun! I am planning on making detachable hashtags so students can add things like #Español1, #Español2, or special occasions like #DíadelosMuertos. If you would like yours to last and use it during the year, I would recommend laminating it. I spent $3 to laminate it for a grand total of $6 for the project. Also, for another option you could customize this document, print it out for students and have them draw or add a picture or themselves to post in the room as a getting to know you activity. If your class uses this, please share pictures with me! This is part two in a series about getting started using novels in her classroom. You can find my post here for Steps 1 & 2 Research and Find Funding. Congratulations! You have now chosen and purchased class sets of novels. Now that you have worked so hard to get these novels, the last thing you want is for them to go missing! If you are a bigger school some of this may not apply to you, but at a small school I am handed the fresh box of books and I am responsible for taking it from there. These are the systems that I have found that work, but please let me know if you have better ideas! Label all books with your school or personal name. Just this summer I ordered a self-inking stamp to mark all of my novels and books for my classroom library. (This is after writing my name in hundreds of new books this year). It was less than $10 with shipping and even if the ink runs out I can use it forever with an ink pad. Number all books. I use a sharpie and number the novels on the bottom spine. This way when the books are stacked on a table in number order, it is easy to see which ones are missing. Assign each student to a number and RECORD this somewhere. The books stay in the room and multiple students may have the same number. When students enter class they grab their numbered book and put it back in the specified location before they leave. It works well to have students put their books in order, so a student or myself can check before everyone leaves if a book is missing. If you have multiple sections of the same class in a row, it works well to have books that stay on each table or desk. The first class sends one student to get their table's books, and the last class puts them back. You need to make sure you do not assign outside reading or homework where they need the novel, because there are not enough copies for everyone to complete it. If a student is absent, they can check out a book to take home to catch up. *Use books that are not checked out to a specific student as loaners, or a student in another class will not have a book for class. I have a checkout log on my desk where students write their name, book title and number, and cross it off once returned. Students are checked out their book and can choose whether each day they leave it in the room in a specified place, or bring it to class. I have found that younger students do better with just leaving the books in class. They are guaranteed to be prepared and it is one less thing for them to forget. Upper level students tend to like to keep their book with them, and are usually prepared with it each day to class. Even if all students have a copy, make sure to have a few loaners for those books that magically disappear and mom brings the book in two years later when cleaning out her now graduate's closet. The number one step is to read the teacher's guides! 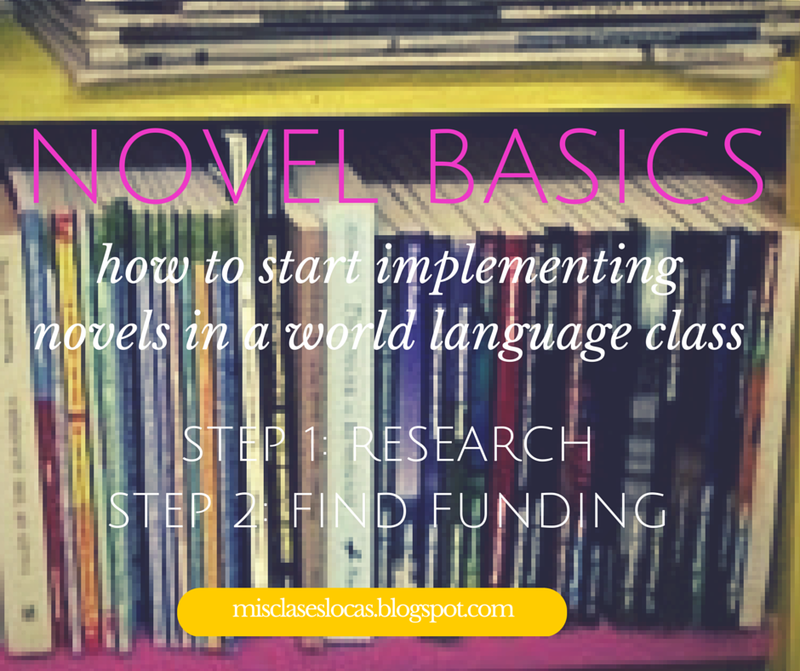 This means when you go back to Step 2: Find funding & buy the novels, you MUST have funding to purchase teacher's guides. Most guides I purchased through the same publisher as the novel, but bought the great guide for Cajas de Cartón from Musicuentos. After exploring the teacher's guides I like to see if any teachers out there have used the novel and what they used for activities and ideas. A quick Google search brings up linked posts about that specific novel from the archive of blogs I probably already follow. I personally like to see reflections of what worked well from teachers who have already tried out the novel. Next, I go to my trusty Pinterest where I type in the title of the novel and then click "boards." 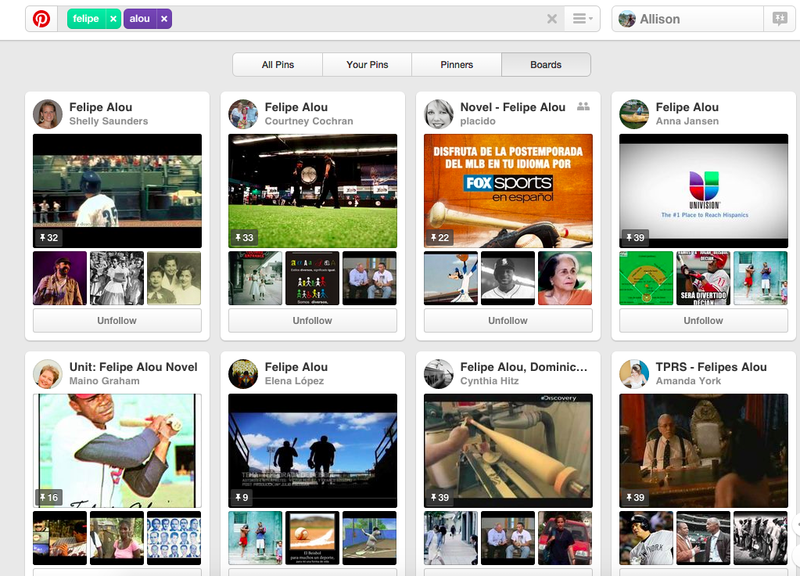 As you can see below there are MANY teachers who have already started boards with authentic resources and ideas related to the novel Felipe Alou. I like to put my favorite ideas on my own board, or start a Google presentation for the novel with links, videos and photos that I plan to use to teach the book. 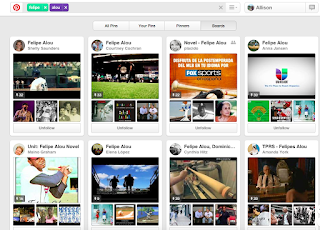 Search the novel & click "boards" for tons of ideas! I then put together all of these ideas to set up a general idea of what we will do while studying the novel. I once heard to plan about two days per chapter, one for reading activities and the other for cultural exploration and connections. I go into more detail in this in posts about resources I used teaching specific novels, which are linked below. If you are interested in using a classroom library for free reading, you can find posts here. If a class set of novels is not an option this year check out Individual Novel Study Part 1 & Part 2. Finally, I have posts labeled reading which includes all of the above and more. As always, please let me know if you have any questions, because it might inspire my next post! How in the world do you decide which novels to use and when? How do the logistics of even getting/having these novels work? By this I mean, how do you go about ordering copies for your classes? How many copies do you order? I am going to put my answers to her into a 4 step process, that I will call Novel Basics. Today I will share steps 1 & 2 Research and Find Funding. In order to know what class sets of books you want to purchase, you need to first do your research. Buy sample packs or books from TPRS Publishing, Mira Canion, Blaine Ray or others and read as many books as you can. This way you know which ones you and your students would like. Also check out this great description of novels by difficulty by Bryce Hedstrom. Even if you do not chose them, all of these sample books will make an excellent addition to your classroom library. I have learned if you and your students are new to novels, it is better to use easier books to start with. The students feel accomplished and you can still have deep discussions on real topics. For example Felipe Alou is technically level 1 novel, but it is in the past tense and has topics of racism and ethnic cleansing in the Dominican Republic. It could be used with any class level with different discussion and focus. Here is what I taught when last year, but it will be changing with a new school. There are many others out there that have taught the same novels at a variety of different levels. Figure out how many separate novels and how many copies of each you need. Many teachers start with requesting one novel set and teachers package for each level.This allows you to get your feet wet and if it goes well you can then read the same novels in multiple levels. If money is not an issue, request one novel per student in each level. If funds are tight, books in class sets of 25 are discounted at TPRS Publishing. I will share in the next post how to organize and implement class sets of novels. Even if funds are tight make getting the teacher's package with the teacher's guide and audio book a priority! These guides are a lifeline and make your first time trying out a new novel so much smoother and more successful. There are many ways that I have heard of getting novels funded. The best and easiest is simply purchasing novels instead of a textbook when your curriculum money comes available. If not, I would go through the three steps below, it that order. Ask your school for funding. I started by requesting four novel sets with the teacher's package (guide and audio book) from my school, one for each level. I am sure your district has a reading goal, so in your proposal emphasize how reading in L2 helps with L1. If there is no money in the general or curriculum fund, make sure to ask the PTO and School or Community Foundation. If there is still no money check out the next option. There are many local, state, and national grants for teachers. For example there is this education grant in my area & the IWLA grant for language teachers in Iowa. I have learned the secret is just to apply! Use some time this summer to do some research and prepare some killer grants. Sell yourself by aligning to your district's reading goals. I have never personally tried this but I know of teachers with success in crowd sourcing sites such as www.gofundme.com & www.donorschoose.org. I have heard that at some schools, students are responsible for purchasing the class novels. I know in high school I had to buy a $15 dollar Spanish workbooks at school registration, so this would not be any different. If possible you could set a $20 fee for Spanish class, which would allow you to purchase 4 books per class. If this were the case, you would want to make sure to have extras in case a students was not able to purchase them. How would you answer the questions above? 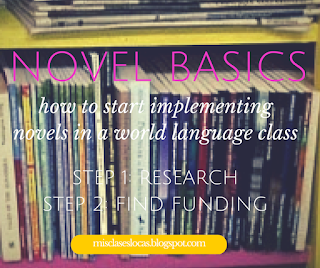 Do you have other methods of choosing and funding the purchase of novels? If you do please share! Up next Step 3: Organize the novels & Step 4: Plan for the novels!